Issue 20 is packed with 151 puzzles, featuring many new Sudoku variants including Arrow Sudoku, Worm Sudoku, Anti-King Sudoku, Quad Clue Sudoku, Argyle Sudoku, Frame Sudoku, Little Killer Sudoku, Extra Region Pointers Sudoku, Offset Sudoku, a huge Odd/Even Samurai 13-grid Sudoku and more, plus the new varieties introduced in Sudoku Xtra 19 are back too. Tapa and LITS puzzles also return this issue, along with many existing favourites, such as Hanjie, Battleships, Hashi, Calcudoku, Slitherlink and so on. There’s a full list on the Sudoku Xtra magazines page. This entry was posted by Gareth Moore on August 13, 2012, and is filed under Sudoku Xtra, magazines. Follow any responses to this post through RSS 2.0. You can leave a response or trackback from your own site. This weekend’s Weekend magazine in the Daily Mail features 8 pages of my puzzles, including some that you won’t find anywhere else. Prize spiral crossword – the clues read both inwards and outwards! Sudoku Xtra 21 is now available, both as a PDF download to print yourself and also as a pre-printed book from your local Amazon store. Follow the links on the Sudoku Xtra website to get hold of it in your preferred form. Sudoku Xtra 19 is now available for download as a PDF or pre-printed via Amazon.com, Amazon.co.uk, Amazon.de and also the French, Italian and Spanish Amazon sites. This issue features 144 varied hand-crafted and language-neutral logic puzzles of over 50 different types, all with a unique solution which can be found without guessing. The 18th issue of Sudoku Xtra is now available, either pre-printed or as a downloadable PDF. It’s designed so each page can be printed separately, so you need only print the puzzles you want to try, and all of the puzzle content is in black and white. I must apologise for the delayed announcement, but Sudoku Xtra issue 12 has been available for a while from www.sudokuxtra.com. Both download and pre-printed copies available. Sudoku Xtra 11 is now available, and it is packed with even more puzzles then last month! Sudoku Xtra 10 – over 60 puzzle types! 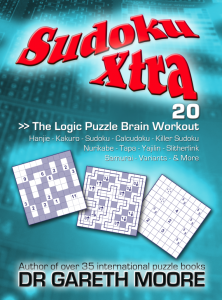 Issue 10 of Sudoku Xtra magazine is now available, and it’s packed with over 60 different types of wordless logic puzzle!